On Stage, the football field, in the board room, internationally ……….. in the firing line. 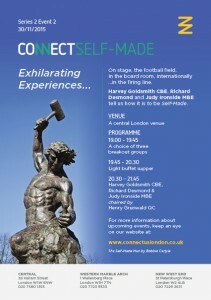 Harvey Goldsmith CBE, Richard Desmond & Judy Ironside MBE tell us how to be Self Made. A series of lectures given by communal educators on the theme. followed by a light buffet dinner courtesy of Hermolis, giving participants a chance to eat and meet. Our highlight of the evening is our panel discussion chaired by Henry Grunwald QC.